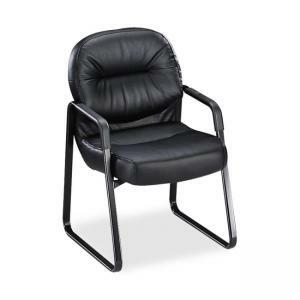 Guest chair with sled base offers quality visco-elastic memory foam in the seat cushion, which reduces pressure points and responds to body contours for lasting comfort. Seat dimensions are 20-3/4" wide x 21-1/2" deep. Usable seat depth is 19". Seat height from floor is 19-1/2". Back dimensions are 21-1/2" wide x 16-1/2" high. Chair is available in black frame only. Certified by SCS to be in compliance with specific indoor air quality emission requirement. Meets or exceeds applicable ANSI/BIFMA standards.